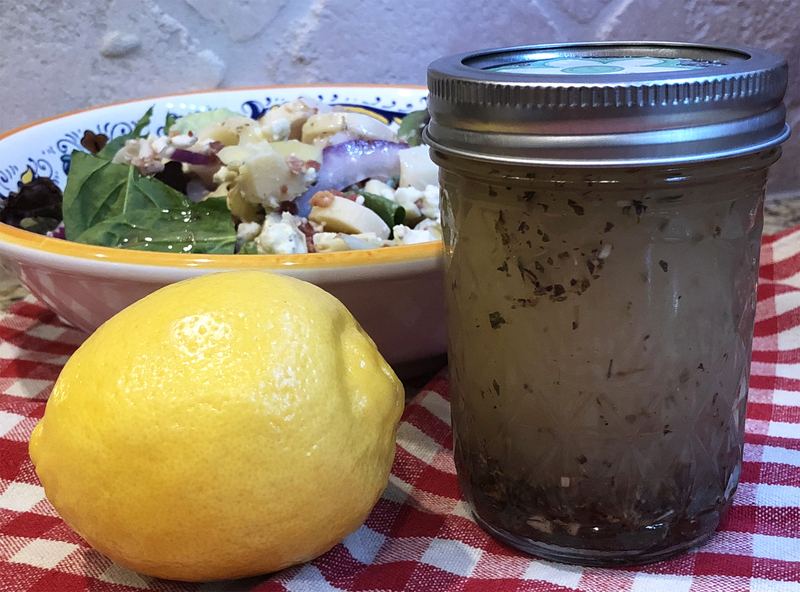 This salad dressing recipe hails from my Cousin Julie’s kitchen and it’s a little slice of history from a speciality retailer that is no more – Frost Brothers. It graced cities including San Antonio, Austin, Houston, Laredo, Corpus Christi… and I saw something about a Dallas opening in my second hometown – Dallas – at the iconic North Park Center. 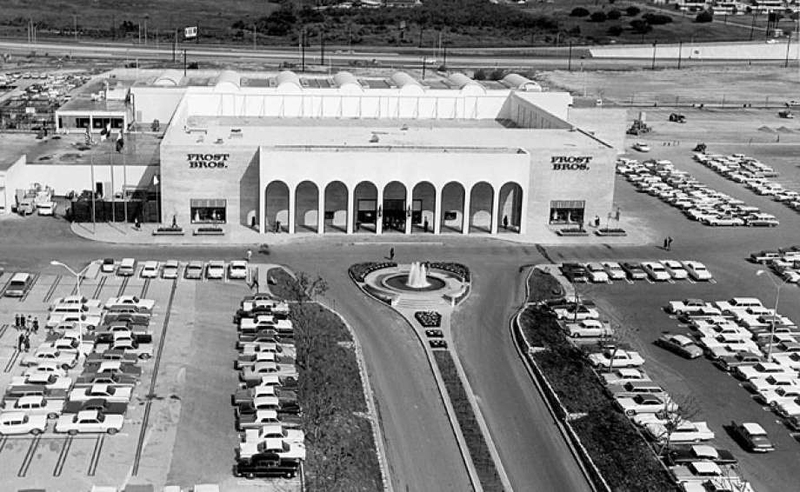 With San Antonio roots dating back to 1917, Frost Brothers is a Texas original considered one of this country’s finest retailers… until it met its demise in the late 80s. 70 years is a long haul and Frost Bros. will be forever missed by those who experienced it. My Aunt Delores would have racks of the season’s finest clothes delivered to her Terrell Hills home so she could try them on and decide the chosen ones… this was about as “froufrou” a thing I could imagine! But then again my Aunt and Uncle also got in-home haircuts back in the 70s and 80s so my relatives were definitely a beat ahead of the tempo before the days of Amazon or the monthly box subscription. I remember when I was a kid I always referred to the fancy store as “Fross Bross” because I didn’t know “Bros.” was the abbreviation for brothers. Who knew?! Apparently my Mom, “Betty,” did because she’d laugh at me when I butchered the pronunciation of the store’s name. For those who remember Frost you’ll likely enjoy this lemon-herb dressing recipe that’s a treasured treat that comes to us via their “Tastesetter” Restaurant… and my Cousin’s kitchen! 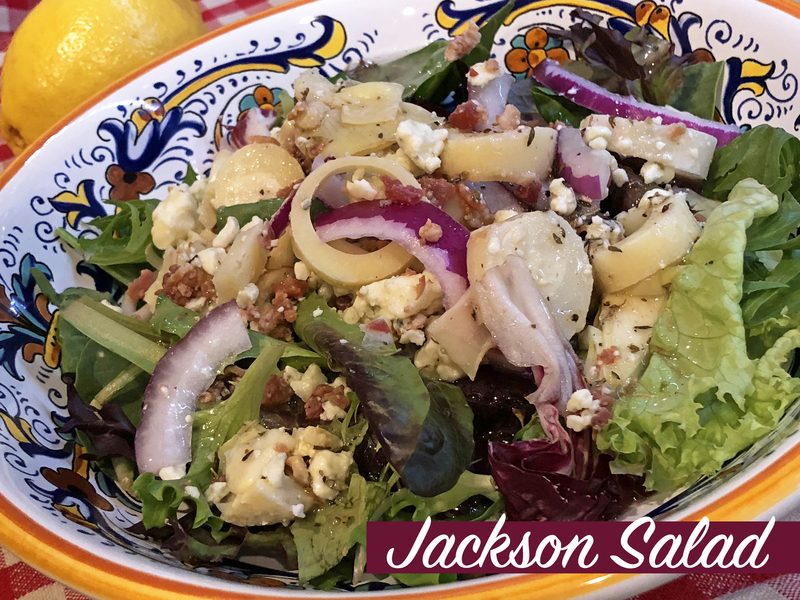 ❤ We served this dressing on top of this family favorite – Jackson Salad. These two creations make a remarkable and tasty pairing, so try them if you can! Especially if you like a salad with artichoke, hearts of palm, bacon, and gorgonzola graced by the touch of fresh lemon and herbs! ❤ While my gut said to use fresh herbs we mostly used dried. Either way you’ll eat your way home a hero. ❤ I noticed on the original recipe (below) Cousin Julie pumped up the jam with MORE basil, oregano, and tarragon (or thyme). We used thyme from the garden (sorry, tarragon). Total prep: About 10 minutes. 1. In a medium-sized bowl blend all ingredients together with a wire whisk until things are nice and smooth. 2. Serve immediately or you can let it rest in the fridge before serving. Yield: 1 ⅓ cups, prepared. 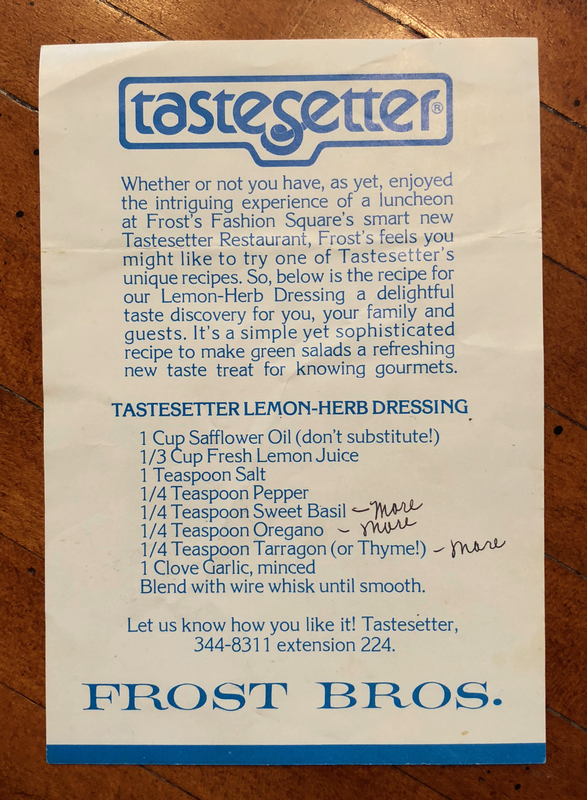 A Scan Of The Original Tastesetter Lemon-Herb Dressing Recipe From Frost Bros. While you whip up this dressing why not get your kitchen a rockin’ with this 1980s favorite from Technotronic!? Crank it! 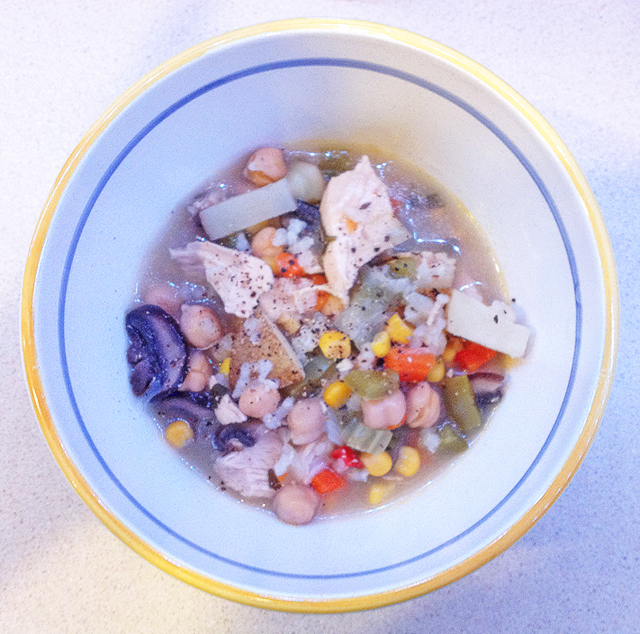 This “BIG SOUP” recipe is insanely flexible! It starts with a base of chicken broth and our familiar friends onion, celery, carrot and herbs. But then the party gets a little crazy – you add whatever fresh, canned or frozen veggies, pasta and or meats that you have loitering around the kitchen, making this soup “soup-er” flexible. Some of the best cooks never follow a recipe to the “t” and this is surely one of their favorites! For more soup: Add additional vegetables and broth. For two meals: Freeze the leftovers. For creamed soup: Add ½ to 1 cup cream 5 minutes before serving. Do not boil the cream! For pureed soup: Put all ingredients (no bones) into a blender and work your magic, until smooth. ♥ If you discover a version you really like, make record of the ratios so you can make it again on the next go. 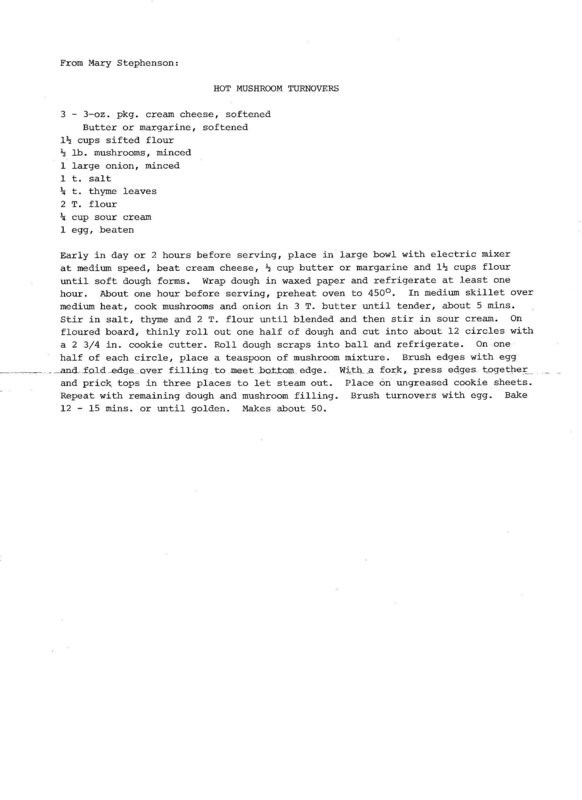 ♥ I was 10 when this recipe appeared in the 1976 edition of Apartment Life Magazine. How alarming it is to see the office phone hanging on the wall in the photo below! PS ~ I also love the bananas T-shirt! 1. 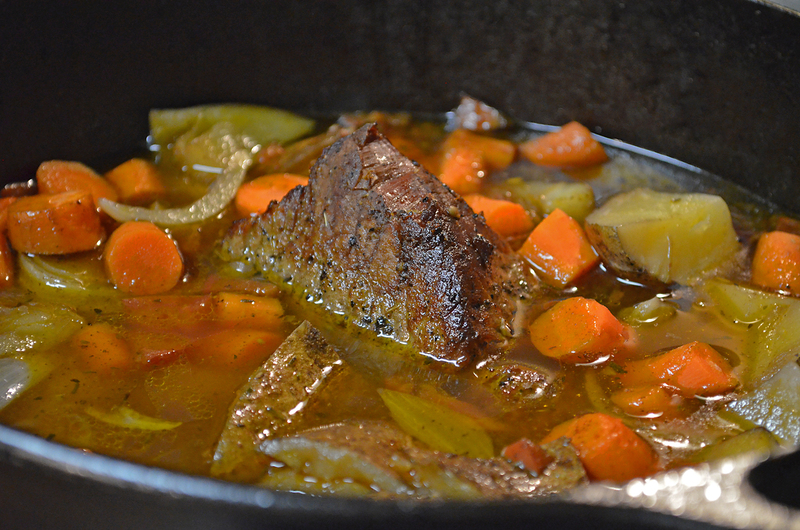 In a medium/large pot over medium heat, add the first eight ingredients in step “i” above. Add water to cover. 2. While waiting for the soup to simmer, scavenge for your step “ii” ingredients above, whatever form they take. 3. Add fresh veggies and rice after the soup’s been simmering 15 minutes or canned, frozen ingredients and pasta after 20 minutes. Simmer soup for 30 minutes or until everything’s done. Growing up, there were certain foods I avoided, like school; brussel sprouts, split pea soup, LIVER and our old pungent friend, the mushroom. I’ve learned to “never to say never” as, with time, things change. Palettes change. And as we grow, we learn to try food before we judge it, as our expectations are sometimes greatly surpassed as we take magical flavor journeys with with world’s wonderfully wide assortment of food. Pair anything with cheese and I’ll love it (well, except liver). So over the years, as mushrooms popped-up here and there at friends’ feasts, I was more and more open to mushrooms. Then my adventures to Italy taught me how the Italians prize porcini mushrooms and truffles. Italians include mushrooms into delicious dishes, just as if they (the mushrooms) had a seat at the head of the dinner table. 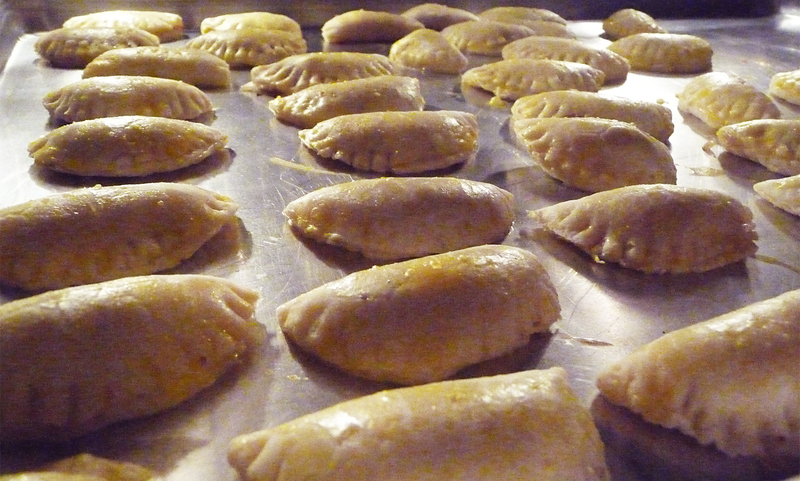 So this week, when out fell this recipe during my search for what to make, I decided to make these turnovers inspired by mushrooms. What’s not to like? 1. Early in the day or 2 hours before serving, place in large bowl the cream cheese, butter and flour. Beat with an electric mixer at medium speed until soft dough forms. 2. Wrap dough in waxed paper and refrigerate at least one hour. 3. About 1 hour before serving, preheat oven to 450°F. 4. In a medium-sized skillet over medium heat, cook the mushrooms and onion in 3 tablespoons butter until tender, about 5 minutes. 5. Stir in salt, thyme and 2 tablespoons flout until blended and then stir in the sour cream (yes!). 6. 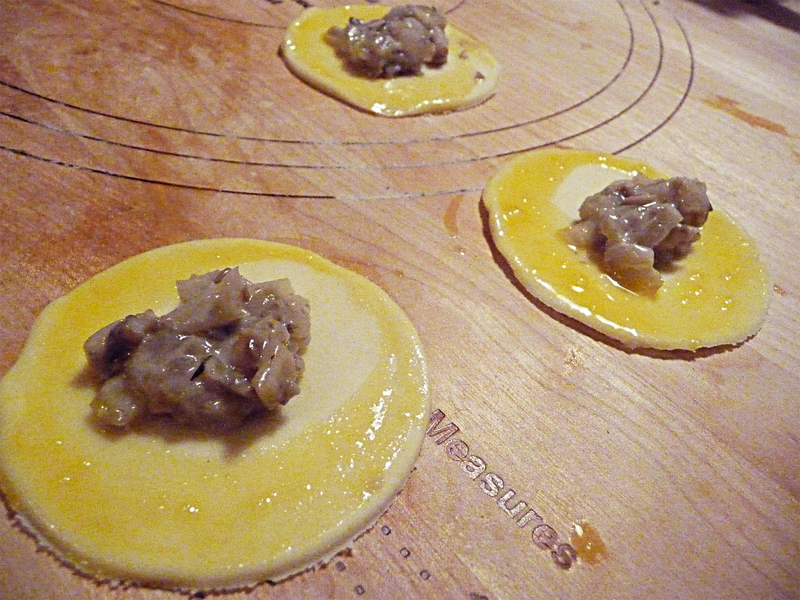 On a floured board, thinly roll-out one half of the dough and cut into about 12 circles using a 2¾” cookie cutter. Roll dough scraps into ball and refrigerate. 7. On one ½ of each circle, place a teaspoon of the mushroom mixture. Bush the edges with egg and fold the edges over the filling to meet the bottom edge. 8. With a fork, press edges together and prick tops in three places to let the steam out. 9. Place turnover on an ungreased cook ie sheet. Repeat with remaining dough and mushroom filling until you’re all done. 10. Brush turnovers with egg. 11. Bake 12-15 minutes or until golden brown. Makes about 50 turnovers. Serve warm. 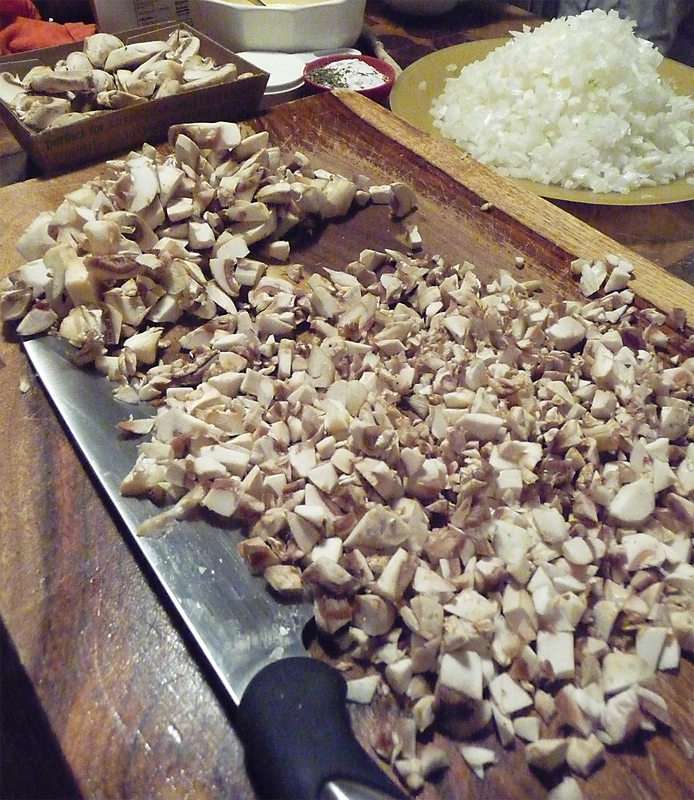 ♥ Use fresh mushrooms for a flavor explosion. Try a little more salt and some pepper if your tongue doesn’t tingle on your first “go” of it. ♥ Can’t find three 3-ounce packages of cream cheese? You’re not alone. It seems our modern day bellies are bigger than the “small packs” so you’ll most likely have to buy multiple 8-ounce blocks or containers of the good stuff and trim ’em down. ♥ Don’t have a 2¾” cookie cutter? I found a small juice glass in my kitchen that measured-up quite fine. ♥ While the original recipe calls for an ungreased cookie sheet, I think I went a little liberal with the egg brushing. I found some PAM Baking Spray helped a lot. ♥ Why not create a mushroom masterpiece of your own? 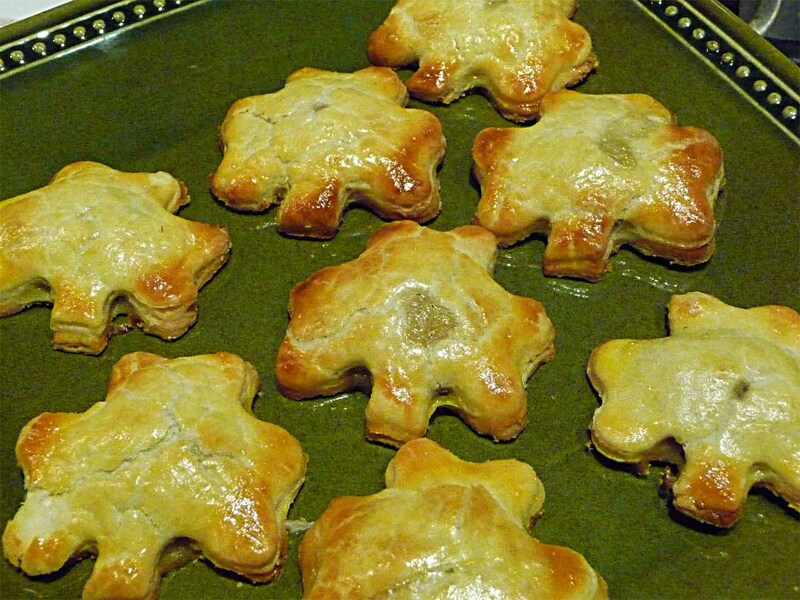 I used a clover-shaped cookie cutter and made my own version of this tasty treat… debuting this St. Paddy’s Day 2012. 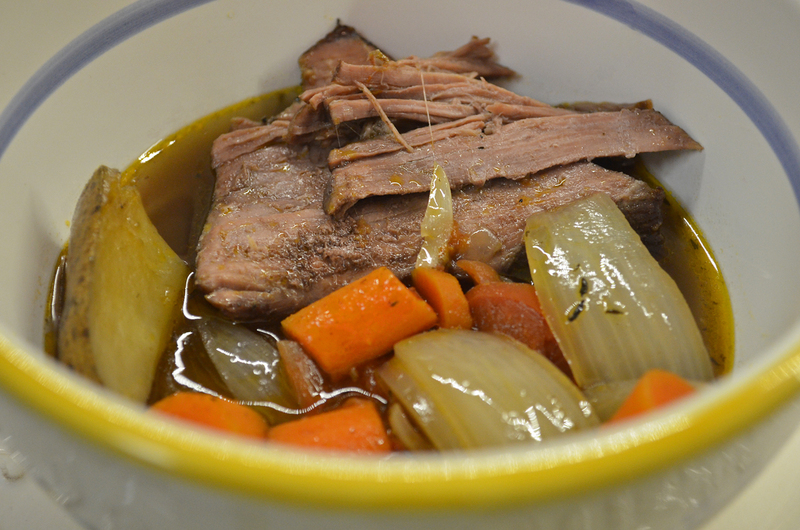 Mary was a fabulous foodie friend of ours and you’ll find a few recipes from Mary’s kitchen here at Betty’s Cook Nook. 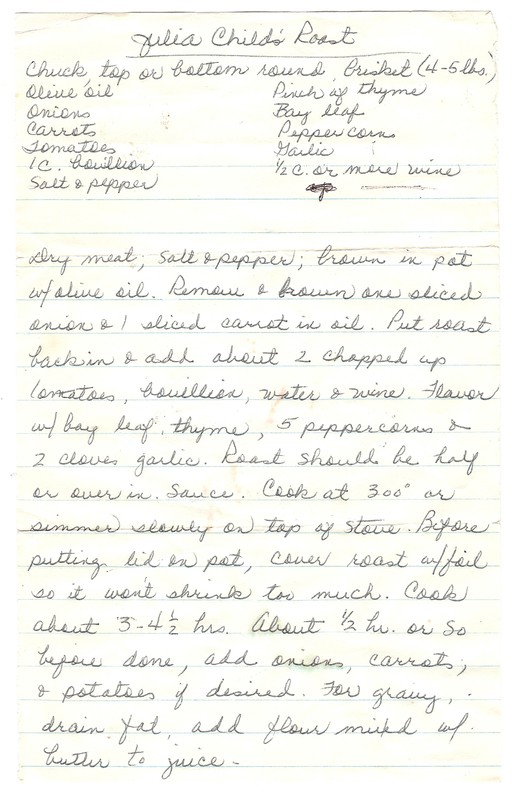 Mary typed-up this recipe on an 8½” x 11″ piece of paper, and I found the original recipe (below) in Mom’s 3-ring black binder.